Today was the first day of racing at the first National Selection Regatta (NSR1). The morning session was a time trial; each boat raced down the final 1900m of the course (the first 100m was left out to create a staging area for the next boat) and times were taken. The results of this trial created the heat assignments. Thanks to Bernhard for the many awkward photos. The day started early with a 4:40AM wake up in order to get ready for weigh-in. The lightweight time trial began at 8:15AM; weigh-ins happen between one and two hours before the racing. Ideally, you weigh in exactly two hours before your race to give yourself maximum recovery time. With that in mind, we arrived at the race course at 5AM. It took me a few minutes to get myself weighed on the practice scale; I was a bit heavier than I would have liked, but nothing unmanageable. I think at least part of it was due to bloating from traveling and nerves; I'm hoping tomorrow's weigh-in is a bit easier. I ended up sweating off some water weight by erging on and off over the course of about 80 minutes. I successfully made weight by around 6:40AM. The extended warm-up ended up being a blessing in disguise—rehydration wasn't difficult as I was incredibly hydrated to begin and the warmth helped ward off the bitter cold on the water this morning. Conditions on the water were pretty rough. The first set of time trials completed before I launched, and gave me some pretty valuable insight: the first 750m had the cleanest water, so take advantage of it. I used this knowledge and the row up to the starting line to feel the wind conditions along the way. It ended up paying off. The person slated to go directly behind me in the trial scratched her entry, so it was just me and the open water. (The next person started 40 seconds behind me.) I pushed hard in the first 600-700m, and then slowly shifted my focus to handling the conditions while maintaining pressure. I placed 10th of 15 (four entries scratched since the entry deadline), a solid start. This took me on to the heats in the evening. 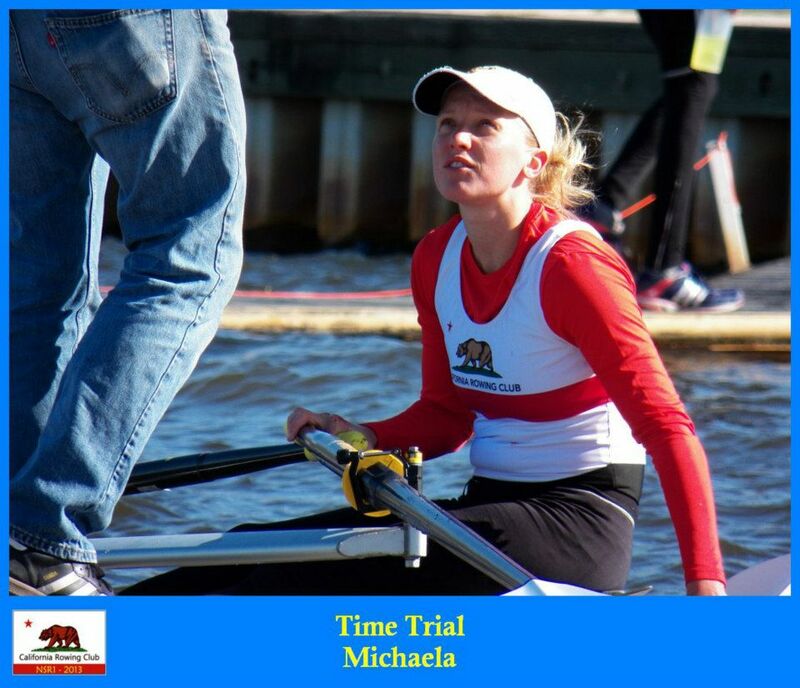 The California Rowing Club had a great day overall; Kristin, the other lightweight woman, placed fifth in the time trial and Stesha and Ann, two of our openweights, placed 8th and 12th respectively. You are only required to weigh in once per day, so weight management during the day was mostly related to tomorrow's weigh in. I spent the day telecommuting to work, napping and relaxing. In the evening, my heat was composed of the 3rd, 4th, 9th, 10th (me) and 15th place boats from the time trial. Four advanced to the A/B semi-final while the fifth place moved on to the C final tomorrow morning. Kristin, Ann and Stesha also all advanced to the semi-finals! Go CRC! My semi-final tomorrow morning is at 8:26AM EST, which will make for a slightly later weigh-in. Yay! I would be very happy with a 4th or 5th place finish in the semi-final, both of which would put me into the B final on Saturday. Every race, I am learning how to race better; in college I relied on my coaches and coxswains to guide me down the course. It's a whole new world out there on your own!